We maintain a long-term, off campus storage facility for all samples ever analyzed in the UVM Cosmogenic Laboratory. The samples are stored in plastic bags and the bags are stored in numbered coolers and buckets. As part of the fire-recovery effort, we updated the sample inventory and reorganized the storage facility. Let's start with some sample moving, action videos. Don't Die! 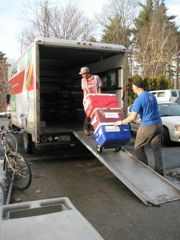 See Matt and Jane in action as we carefully maneuver a 17 foot uhaul truck carrying several tons of rock. Move buckets! See the cosmo team moving years worth of samples back to their final repository from the warmth and comfort of Delehanty Hall. 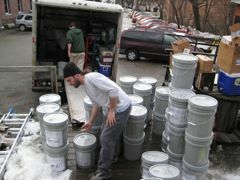 The move-back of more than 100 numbered buckets from Delehanty Hall to our off campus storage required half a dozen people. 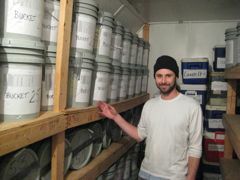 Luke illustrates the organization of the off-campus sample storage facility. Shelves filled with buckets are augmented with stacks of numbered coolers. 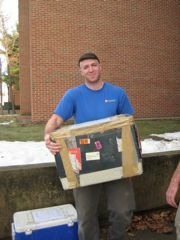 Matt demonstrates the importance of brute strength as he carries an antique cooler that's been around the world sans handles. 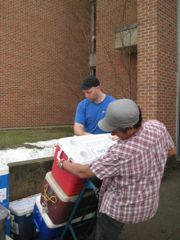 While Matt is recovering, Jane uses skill to manipulate three full coolers of samples on their way out of Delehanty Hall. Paul tries to stay balanced with one bucket in each hand while wishing he had a t-shirt on. "How can we ski on this?" he is thinking. 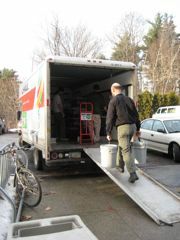 Careful teamwork and a bit of luck ensured that all the samples were safely loaded onto the U-haul on a very warm January day.